Mali Obomsawin is originally from Farmington, Maine, and grew up attending Maine Fiddle Camp for bass and mandolin. A Franklin County Fiddlers alumna, she went on to study jazz performance at Berklee College of Music for four semesters before transferring to Dartmouth College where she will graduate in 2018. Mali sings and plays bass in her nationally touring band Lula Wiles (who met at MFC! ), and has performed at premier festivals and venues along the east coast. She has shared the stage with Laura Cortese & the Dance Cards, Matt Glaser, Greg Liszt, Caitlin Canty, Stash Wyslouch, and Jason Annick, among others. Specializing in folk, jazz, and traditional styles, and a songwriter, herself, Mali’s versatility as a musician grounds her in a deep understanding of the differences in stylistic approach. 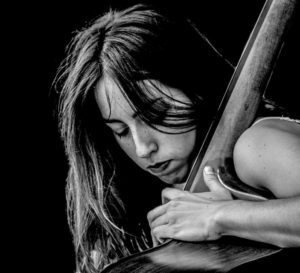 Her instrumental virtuosity landed her at the the highly selective Acoustic Music Seminar in Savannah, GA, in 2017, where she studied and performed with Bryan Sutton, Mike Marshall, Aoife O’Donovan, and Julian Lage. She has also studied privately with John Clayton, Gregg August, Susan Hagen, Zachariah Hickman, and Michael Formaneck. A young and promising musician, Mali enjoys teaching at camps, leading workshops, and exploring the finer points of ensemble playing. She also enjoys reading, debating, running, and generally nerding-out about the BASS!